The Taxi service of the Island is considered by tourists really too expensive! But Ischia in the past was famous just its hospitality and courtesy. 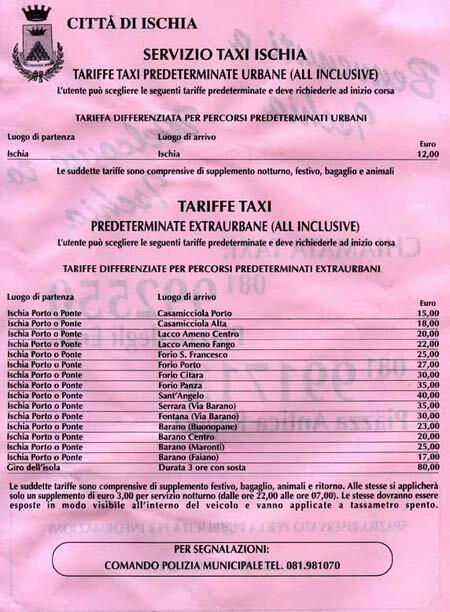 These are some prices by taxi to reach the main Ischia ocations. Ischia - Ischia 10,00 € + 1,50 € luggage. Recommended to who arrives in Ischia and who have to leave, it’s possible to buy transfer from the airport or terminal, to your accommodation and vice versa before to reach to Ischia at a good price. In Naples since 2004 the Consorzio Taxi Napoli With over 500 cars and an important organization in South Italy. In a modern structure with new communication services. It has also 45 phone dials lines, and 2500 contacts a day, guarantees a good service on the local territory, has also 100 places for cars in the city, and always at customers disposal.